Owner Travis Whiteside: "I'm so stoked every day to come to work, because I absolutely love it." 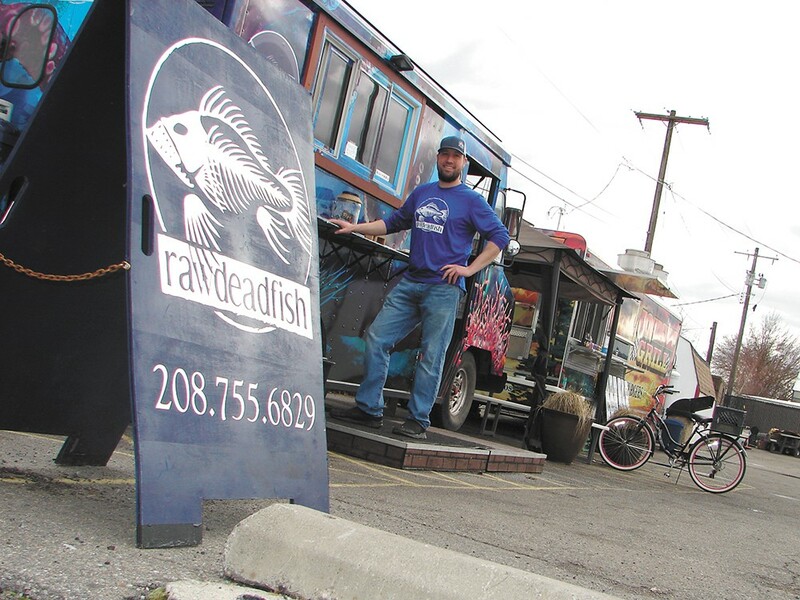 If you notice a glow from inside the RawDeadFish food truck, fear not; that's just owner Travis Whiteside. Part of it is the 38-year-old's new routine of running and riding his bike from his nearby Coeur d'Alene home. But most of it is just being in business for himself. "I used to look at business owners, and they have a certain glow," he says. After years of working for others — Bonsai Bistro, Fisherman's Market — Whiteside finally has his own place, which in April celebrates one year in business. "I'm so stoked every day to come to work, because I absolutely love it. The way this works," he says, gesturing around the cozy, customized space, "is more than I expected." With the help of friends and family, he outfitted the truck with everything necessary — a rice cooker, freezer, and all-important deep fryer — to make signature rolls like the crispy Bruce Lee or Caterpillar with smoked eel. The only thing he'd do differently inside the truck, says Whiteside, is make it bigger, especially since he's hired another chef, Danna Piper — the "Sushi Slinger" to Whiteside's "Sushi Ninja." "We kind of kept a core menu and did it really well," says Whiteside, who has nearly 20 years of industry experience and customer feedback guiding his menu. "You want that love that you wish you had if you made it yourself." Whiteside uses Facebook and word of mouth to promote the food truck. Consistency, he says, is important, not only in the food but in the hours he's open. "They kind of depend on you to be there when they need you," he says of his customers, many of whom he knows by name. Whiteside also gets business from the truck itself, which is parked along busy Best Avenue, between even busier Fourth Avenue and Seventh Avenue. The hood vent looks like an octopus, whose purple tentacles wrap around the exterior of the food truck. Look closer at the Jacques Cousteau-like underwater scene for a flotilla of miniature Nemo magnets, a nod to Whiteside's quirky sense of humor, which includes the truck's unique name. "The truck works!" he says.